More info:From £1699 - £1799 excluding flights. Optional single supplement £395. Mimimum age 16. 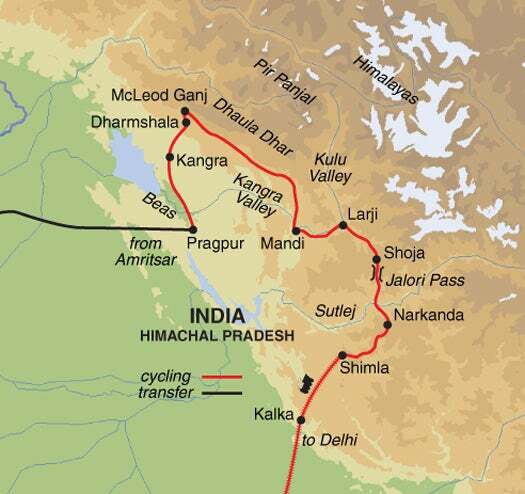 This 17 day India hill stations cycling holiday takes you through the homeland of the Dalai Lama in the shadow of the Himalayas with a combination of peaceful rural roads and temple-filled towns creating indelible images as you cycle an average of 45kms from point to point per day. From the Golden Temple at Amristar to the Hindu temple at Mandi, this India hill stations cycling holiday offers a treasure trove of cultural landmarks alongside opportunities to find out more about British influences within locations like the former capital of Shimla. Himalayan scenery makes for a breathtaking backdrop with views from the Jalori Pass certain to make the ascent all the more rewarding on this incredible India hill stations cycling holiday for small groups.